I've always been more of a fan of upbeat pop hits, but I tell you what - when a ballad is done right, it can be sensational. And, like most things in music, ballads weren't done any better than in the '80s. "Hello, it doesn't even look like me!" This week in 1984, three of the year's biggest slow songs debuted on the ARIA singles chart. Two of the new ballads were stirring, emotional tunes that earned their places in music history. One was a duet between Willie Nelson and Julio Iglesias. The chart also underwent a slight design change this week in 1984. 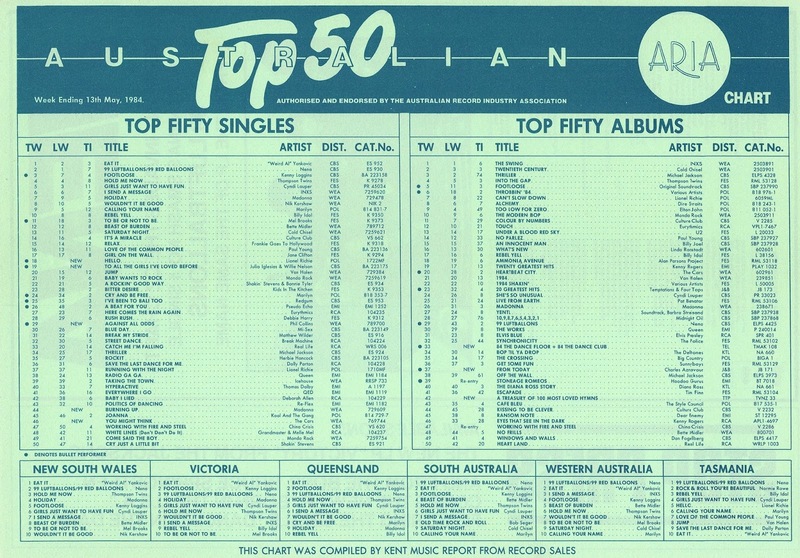 All reference to Countdown was removed and it was rebranded as the Australian Top 50 ARIA Chart. A new look deserved a new number 1, and it got one as "Weird Al" Yankovic's "Eat It" replaced Nena at the top. Like previous single "Cut The Talking", this pop gem didn't progress very far but it did have longevity, sticking around on the top 100 for 16 weeks. Was the music video for this lead single from Heartbeat City better than "Thriller"? MTV thought so, making it the inaugural winner of the Video Of The Year award at the first MTV VMAs in September 1984. It was certainly cutting edge for the time, with then-revolutionary animation effects used to insert singer Ric Ocasek and the rest of the band into scenes featuring model Susan Gallagher. 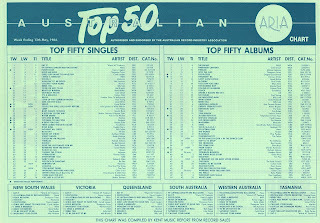 A surprisingly modest hit in Australia, the US top 10 single did at least return The Cars to the chart for the first time since the similarly jaunty "Shake It Up", which had reached our top 10 in 1981. Like the rest of the album, "You Might Think" was co-produced by the band with "Mutt" Lange, who was between Def Leppard albums at the time. It'd visited the top 100 briefly at the end of 1983, but thanks to the runaway success of "Holiday", which was still climbing the top 10, Madonna's second single was given a second chance. The fact that "Burning Up" actually had a proper music video worked in its favour, with Countdown play of the clip contributing in no small part to renewed interest in the song. The video, directed by Steve Barron ("Billie Jean", "Don't You Want Me", "Promised You A Miracle"), was also the first demonstration of the part sexuality would play in Madonna's career as she writhed around suggestively on the road. The twist at the end of the clip, however, established from the outset that she literally wouldn't be playing the part of victim and was a woman who was firmly in charge. Nothing like starting how you intend to go on. Sometimes a song benefits from being featured in a hit movie - the enjoyment of the film prompting people to go out and buy the theme tune. In the case of this mega ballad by Phil Collins, its popularity actually helped the box office cause of the film it was specifically written for: Against All Odds. Well, rewritten for. "Against All Odds (Take A Look At Me Now)" was actually based on an earlier song, "How Can You Sit There", which dealt with Phil's first divorce and didn't make it onto 1981's Face Value. When he was approached to contribute something to the movie's soundtrack, he revisited the track, tweaking it so it was appropriate. That said, he did mostly sing "against the odds", instead of "against all odds". After a string of flop singles from second album Hello, I Must Be Going!, "Against All Odds..." put Phil back near the top of the chart. In the US, it was the first of his seven number 1 hits between 1984 and 1989. Despite horrendous cover versions over the years - like the shriek-fest between Mariah Carey and Westlife in 2000, and its use as winner's single for inaugural X Factor UK champ Steve Brookstein in 2004 - the tune has stood the test of time and remains one of music's greatest ballads. Next up, a ballad that hasn't dated quite as well. "To All The Girls I've Loved Before" was originally recorded by its co-writer Albert Hammond, who was partially responsible for, among many other hits, "Nothing's Gonna Stop Us Now" (which we saw in this week's 30 Years Ago... flashback) and "When You Tell Me That You Love Me" (the Diana Ross song that also got turned into a vocal battle with Westlife). A pretty unlikely combination, Latin superstar Julio Iglesias and country legend Willie Nelson teamed up to remake the song for Julio's incredibly successful 1100 Bel Air Place album, which established him on the English-language music scene. The song also gave each of the pair their first - and only - top 10 hit in Australia. It's a tale as old as time. 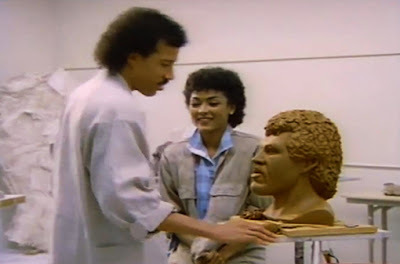 A theatre teacher/creepy stalker falls in love with one of his students, a blind girl he thinks has no idea of his feelings until she, through the medium of pottery, demonstrates she also cares for him. "Hello", the biggest of this week's three big ballads was also a song that, like "You Might Think" and "Burning Up", made an impression because of its iconic music video. Not necessarily a great impression, with the clip derided by some (including, memorably, Hey Hey It's Saturday) as one of the worst of all time. Although "Hello" appeared on Can't Slow Down and was lifted as its third single, like "Against All Odds...", the song dated back to an earlier project. The ballad had been written for Lionel's self-titled debut solo album but was left off. Apparently it was Lionel's then-wife, Brenda, who encouraged him to include it on his second LP. Good thing she did - not only was the song a worldwide chart-topper, but it also sold a million copies in both the US and the UK. And, to this day, it has continued to crop up everywhere from Pushing Daisies to Trolls to that viral Adele mash-up. Next week: He may have had no more singles to squeeze out of Thriller, but that didn't stop Michael Jackson returning to the chart once more. Plus, the follow-up to 1984's funnest number 1 hit. I wonder what prompted the removal of the Countdown logo from the chart. It is surprising 'You Might Think' didn't even crack the top 20. I'm surprised 'Burning Up' wasn't a hit anywhere else. For me, it's one of her better singles. 'Against All Odds' is probably one of my favourite Phil Collins songs. He does sing the title though at the end of the last chorus. My mum had the Julio Iglesias album, but I barely remember the song (thankfully). Spoiler alert - I think I noticed recently that the run of singles from 'Can't Slow Down' in Australian went 1-24-1-24, which is rather interesting (or so I think). So what is the twist at the end of the Burning Up video? I've never watched it and can't really be bothered too. Nathan - Burning Up wasn't given widespread global release. It was issued as a single in the US and peaked well outside the Top 100, but other than that, it was only released in Australia, some European countries (e.g. Italy and Spain) and Japan. Thanks for the info. Similarly, it's interesting New Zealand got 'Everybody' as a single but we didn't. Very interesting, yes (which means that Gavin, your comment about it being Madonna's "second single" isn't actually accurate for the Australian context (it was her debut single in Australia). In this context, I'm referring to it as the second single of her career.